This is on the fringes, alright! Although the lyrics appear to be missing syntax, the slide of meaning presented in those four lines adequately represents the experience of listening to Fringe, displaying an inclination to lose the listener in twisting structures and irregular emphasis. Goodtime riffs and heads duly banged this is not. Musically, Fringe has been constructed in the same manner as Sheldon Cooper’s criticism on his peers’ work: a sort of “Let’s assume that everything you have done until now is wrong” restructuring takes place. Band names such as Neurosis and Triptykon may orbit the sound, but Lurk very much have their own gravitational pull. According to the most impressive tracks here, such as “Furrow”, Neurosis were doing things wrong by trying to incorporate too many different styles into their shifting moodscapes, while Triptykon and Mr Warrior himself apparently never used the distinctive vocals to their fullest effect. As for other extreme-influenced doom and sludge groups, Lurk show them up as unimaginative and predictable in their orthodoxy. “Furrow” does possess a grindingly heavy main riff, but that riff doesn’t boom out from the guitar of Arttu Pulkkinen as chords or a single string assault, rather melding low chords with mid-range dissonant notes to form an overwhelming swamp of sound. As it progresses, the melodies Pulkkinen plays stand stark against restrained bass playing and temporarily muted drums, which a moment before had crashed restlessly against a gentler riff. Other than the menace of disorientation, Fringe proves capable of more general exploits. “Nether” is overall the simplest song, the only one to capitulate before four minutes: the piece succumbs to a basic sludgy roar, though it works as a prelude to the longer closer much as “Cutting” did for the title track on the preceding album Kaldera. Similarly, “Ostrakismos” (aptly based around the theme of ostracism) spends more than half its duration stealing the listener away from their surroundings with shifting ambiance and the build-up of tension, finally stabbing home with one of the more forceful doom riffs and a few skulking verses from Koskinen that belie its role as a deliberate instrumental introduction to the album. The remaining cuts bear slightly less of distinction, though enforce Lurk’s methods and maintain a portion of insidious atmosphere. Deciding on the quality of an album such as Fringe is always frustrating, largely because the originality of the music greatly outweighs considerations of its enjoyment. Suffice it to say that no possibility exists of merely listening to Lurk “for fun”, nor will the casual listener extract much of worth from the album, since the evenness and gradual, creeping change of the songs represents their finest feature. However, for those willing to dive down into the murk, engrossing detail and hypnotic movements prove their worth, while the lyrics set the bar extremely high for unsettling abstractions. Because the recent release of Fringe on various formats by Transcending Obscurity Records actually marked more than two years since its original independent release, we may be able to expect more introspective menace from Finland before too long. Consider this album an opportunity to get acquainted. 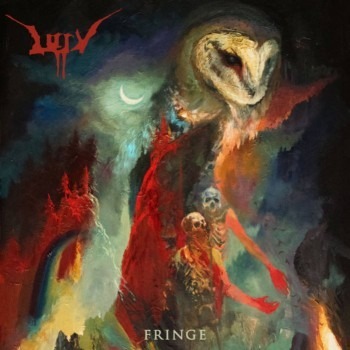 This entry was posted in Reviews, Stoner, Doom, Sludge and tagged 2016, 2018, doom metal, Enslaved, finland, fringe, lurk, neurosis, Sludge Metal, Transcending Obscurity, Triptykon.